The day of 27th September (2016) marked the advent of two vehicles being introduced in Pakistani Automotive market. It is true that Pakistani Automotive industry scarcely witnesses the launch of new cars, but with the Government?s recent take on the new auto policy and the ongoing economic corridor (CPEC), perhaps Pakistani Automotive Industry is finally beginning to shift its gears. Indus Motors Company held an event on 27th September in Pearl Continental, Karachi. After months of speculations and spy shots, the company has finally unveiled two new vehicles: Toyota Hilux Revo and Toyota Fortuner. Stay tuned for more details as we will be covering these vehicles in detail in the coming days. Beauty indeed but again same 2700cc engine which is low on power a diesel would have been nice! Those who enjoy driving and performance will be highly disappointed if only 2.7 gasoline engine with that silly 4sp auto transmission is thrown in again. For Show-sha, its fine. Such a pretty and all-new vehicle deserves to have the new 1GD engine and 6spd transmission. Although Toyota Indus mgmt may think about Pakistan's buyers otherwise about what they deserve! Is it a case of an old donkey in new clothes?? If IMC is thinking of positioning REVO at Rs 4m to Rs 4.5m range and FORTUNER at Rs. 5.5m, which the chatter on PW hints at, then it is in for some serious competition this time during the next five years and onwards. Must better and competitively priced alternatives are now (and going to be in future) available for car enthusiasts in Pakistan. IMC already faced embarrassment when it's local Prius turned out to be a complete failure with not a single unit being sold (please correct me if I'm wrong on this). The reason was it's price-positioning. 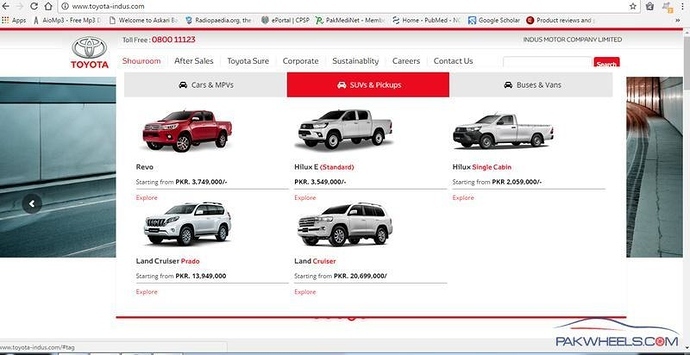 Another embarrassment was faced earlier when it had to re-position Fortuner's price in mid-2014 after it saw lack of interest in it from potential customers and brought down it's price from Rs. 5.7m to Rs. 4.7m - an unprecedented 21% drop. Even that couldn't help push up Fortuners' sales to the level that IMC would have liked. And with the above-mentioned price positioning for REVO and new Fortuner, it is apparent that IMC hasn't learn't from it's past mistakes. With the BMW X1 at between Rs 4m to Rs 5m and other self-import options available to prospective customers, positioning REVO at Rs. 4-4.5m and Fortuner north of Rs. 5.5m would lead IMC towards another embarrassing situation in the near future. I am new to this forum and I posted a query, no rely? Is this is a welcome to a new comer? 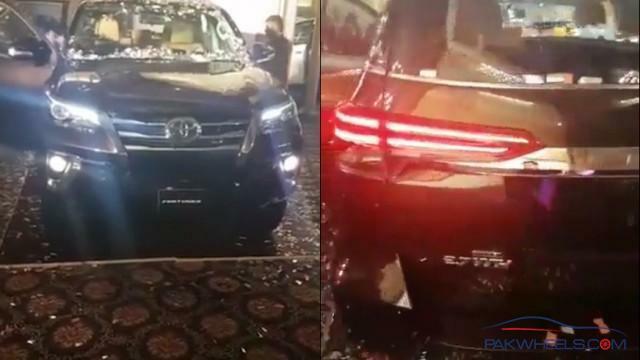 Is Fortuner availablein Pakista with recerse built in camera and with front and back parking sensors? why the new fortuner not visible on IMC website? Because order taking has not started yet. when order taking will start ? The Brochures are getting finalized at the moment. Cant wait to get a fortuner they are much much cheaper than a new Parado which is +10 million (!) more and are as tough as nails. Would love to explore Pakistan with this car. Prado is only good if its 4000cc TZ variant with kinetic suspension and t speed auto... but it will still lack paddle shifters 6speed Cruisetronic rear independent AC vents. Also this time fortuner angle of approach and ground clearance is better and water wading depth equal 700mm. Its time to sell & change or it will be too late then once fortuner on roads! Sounds like a promotional spree has already been started by Toyota even before anyone has gotten a chance to drive it ... Guys please keep the forum clear of promotional and biased posts. Prado has rear independent ac, cruise control and tiptronic transmission.